To anticipate puddles in the upcoming rainy season, a connecting channel of Jalan Laut Banda, Duren Sawit, East Jakarta is normalized.
" Normalization is done to accommodate water in large quantities during rainy season"
East Jakarta Water Resources Sub-dept. 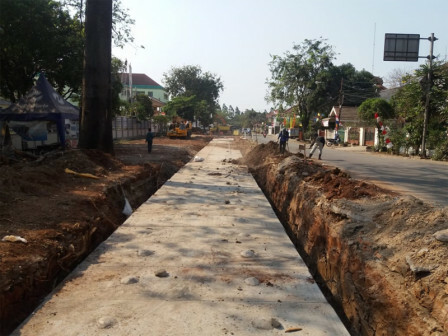 Head, Mustajab stated that the channel is normalized up to 600 meters and the width will be added from 2 meters to 2.4 meters. Then the depth will be added from 2.8 meters to 3.5 meters. "Normalization is done to accommodate water in large quantities during rainy season," he stated, Thursday (10/11). His sub-dept. is also making a new water channel in the location. The volume will be the same and its location will be parallel but limited to the road body. All this work is targeted for completion in mid-December. Fund for normalization and development of channel is integrated with the Jalan Raya Cacing connecting channel normalization program, amounting to Rp 41 billion.